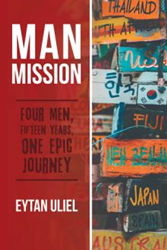 Part travel narrative and part roman à clef, Man Mission: Four Men, Fifteen Years, One Epic Journey (published by Archway Publishing) by Eytan Uliel follows four regular guys on an international, adventure-packed, humor-filled search for meaning and purpose. Beginning while the four friends are in college, Man Mission takes on the friends annual adventure trip, visiting 15 different exotic locations across 15 years. Along the way, from their 20s into their 40s, the characters also experience major life events, growing through relationships, marriage, family, aging, and work and life choices. The narrative explores the mens journey of growth, and their emotional awakening in a world where the traditional rules of being a man are no longer clear. Man Mission is available for purchase at: https://www.amazon.com/Man-Mission-Fifteen-Years-Journey/dp/1480862916. Eytan Uliel is a storyteller, wanderer, global traveler and seriously committed gourmand. After graduating from the University of New South Wales in Sydney, Australia, he practiced corporate law for several years, before moving on to a career in investment banking, private equity, and oil and gas finance. He chronicles his travels on his blog, The Road Warrior. Born in Jerusalem, he currently divides his time among Los Angeles, Nassau, Bahamas, and Sydney. Man Mission is Uliels first and only book, although another is in the works.